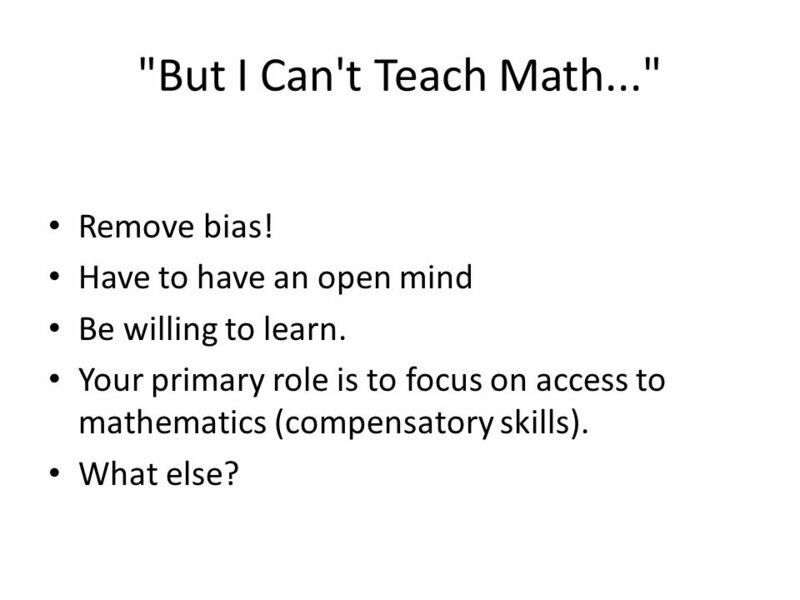 2 "But I Can't Teach Math..." Remove bias! Have to have an open mind Be willing to learn. 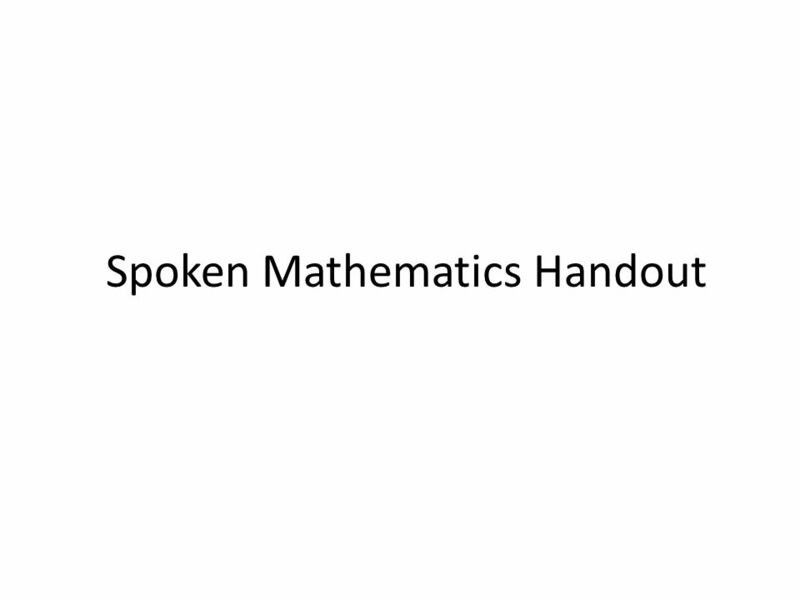 Your primary role is to focus on access to mathematics (compensatory skills). What else? 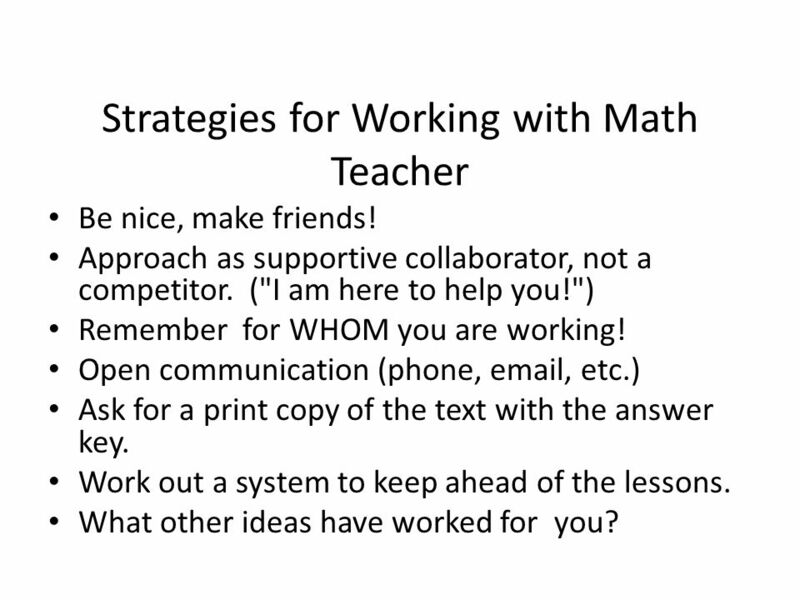 3 Strategies for Working with Math Teacher Be nice, make friends! 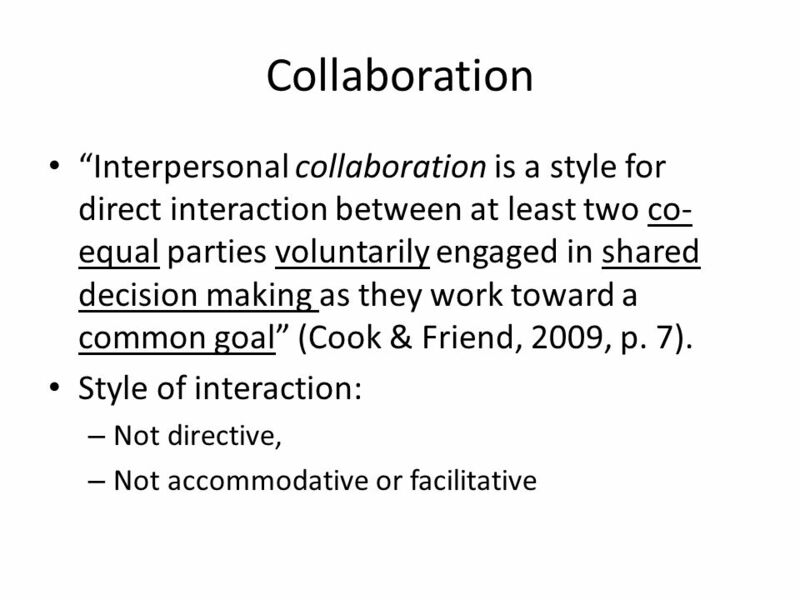 Approach as supportive collaborator, not a competitor. ("I am here to help you!") Remember for WHOM you are working! Open communication (phone, email, etc.) Ask for a print copy of the text with the answer key. 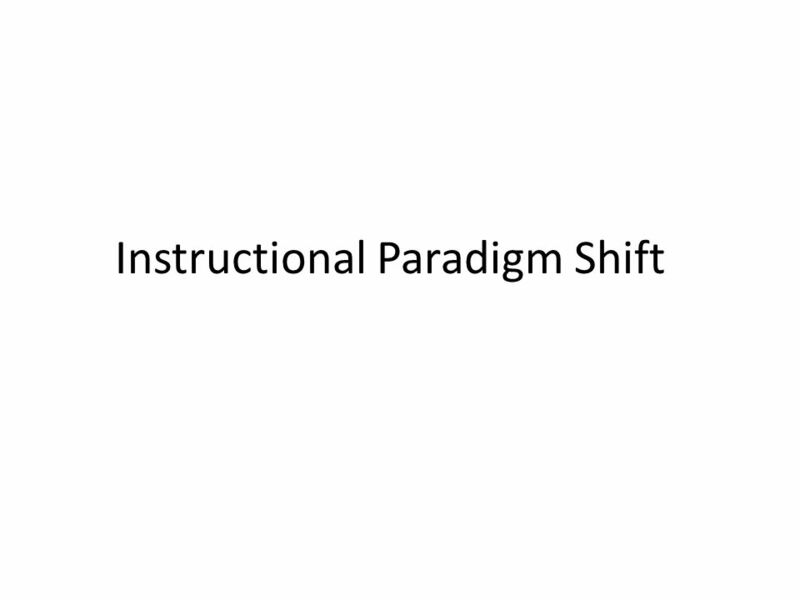 Work out a system to keep ahead of the lessons. What other ideas have worked for you? 4 Etiquette: What to teach them! Treat student fairly, not equally. Using terms such as "see", "look", "write", etc. is okay. Avoid vague positional terms such as "over there". Be specific: "Two inches to your right." 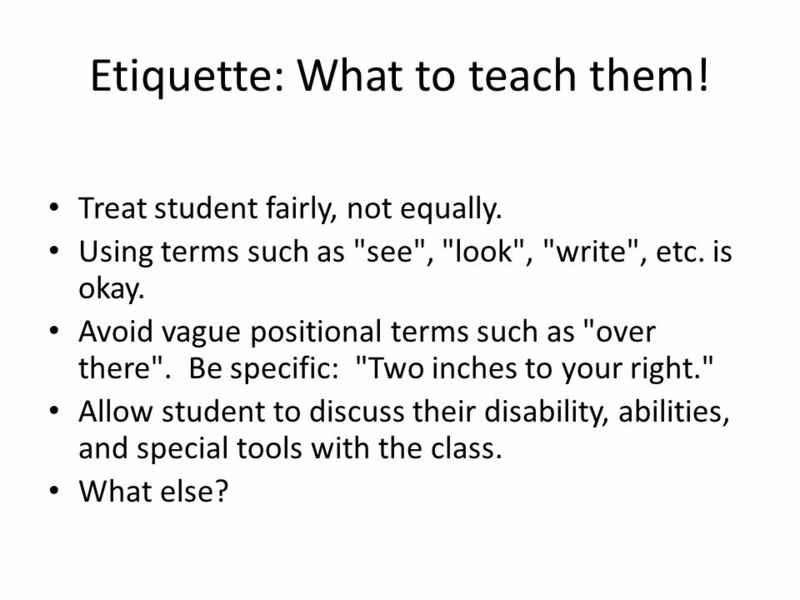 Allow student to discuss their disability, abilities, and special tools with the class. What else? 5 Sighted Guide and Room Teach the math teacher and the students how to use sighted guide. – This is not only for movement around the classroom but for emergency situations. 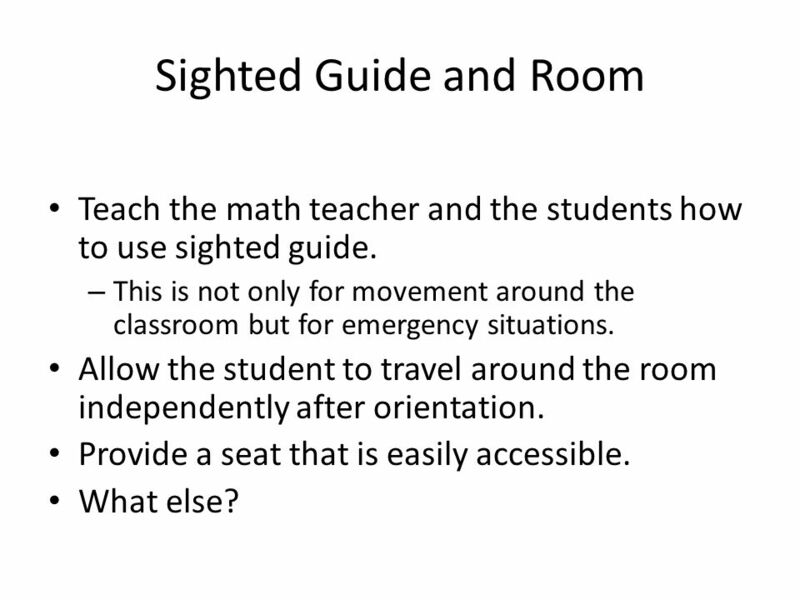 Allow the student to travel around the room independently after orientation. Provide a seat that is easily accessible. What else? 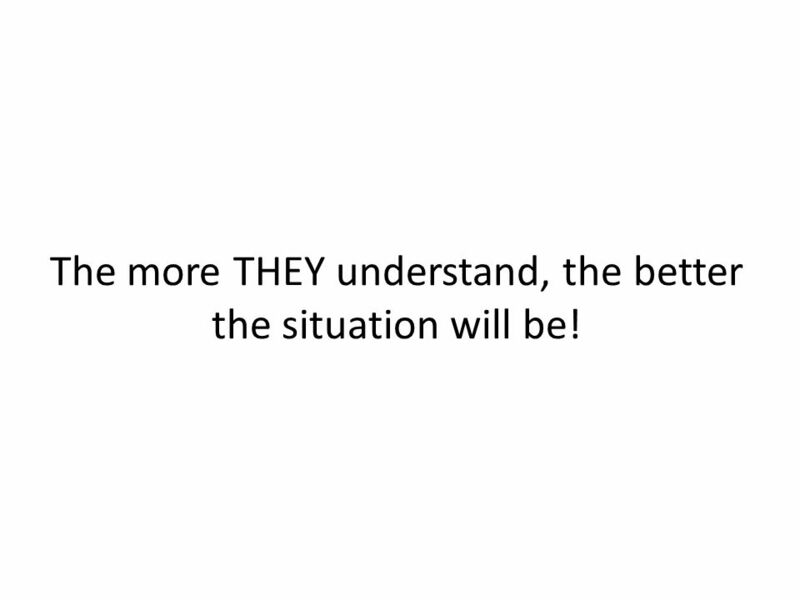 9 The more THEY understand, the better the situation will be! 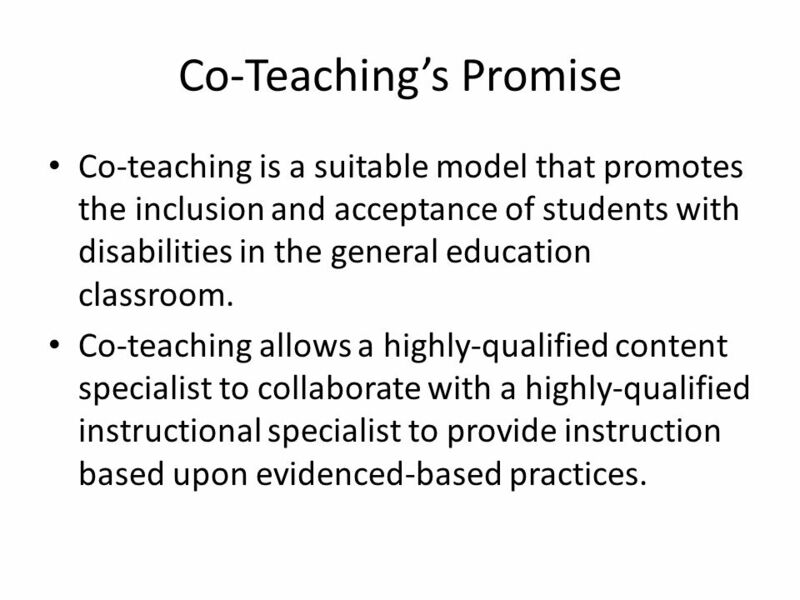 11 Co-Teaching’s Promise Co-teaching is a suitable model that promotes the inclusion and acceptance of students with disabilities in the general education classroom. 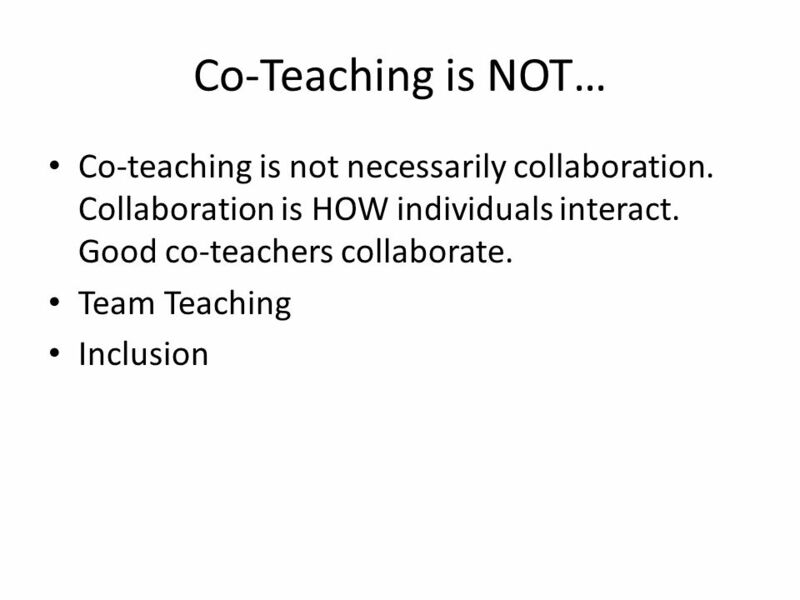 Co-teaching allows a highly-qualified content specialist to collaborate with a highly-qualified instructional specialist to provide instruction based upon evidenced-based practices. 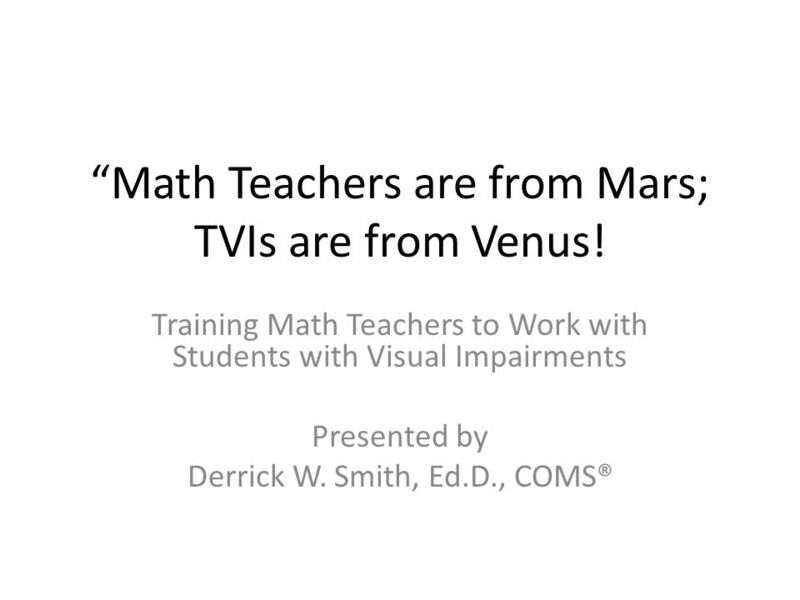 Download ppt "“Math Teachers are from Mars; TVIs are from Venus! 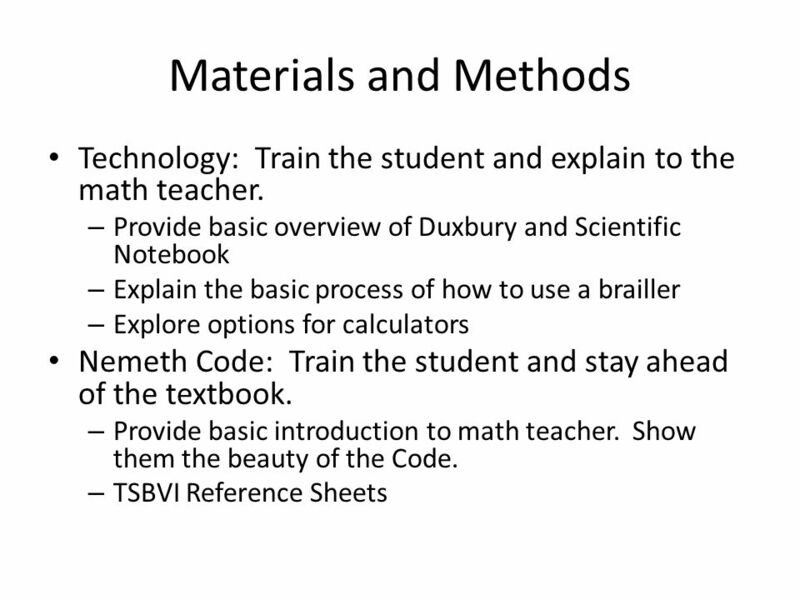 Training Math Teachers to Work with Students with Visual Impairments Presented by Derrick W. Smith,"
Co-Teaching Whittney Smith Adelphi University.  Peer Buddy Program Dawn Hansen.  Using peers to teach/model independent living skills. Copyright © Allyn & Bacon 2008Chapter 4: Creating Partnerships through Collaboration Chapter 3 Copyright © Allyn & Bacon 2008 This multimedia product. 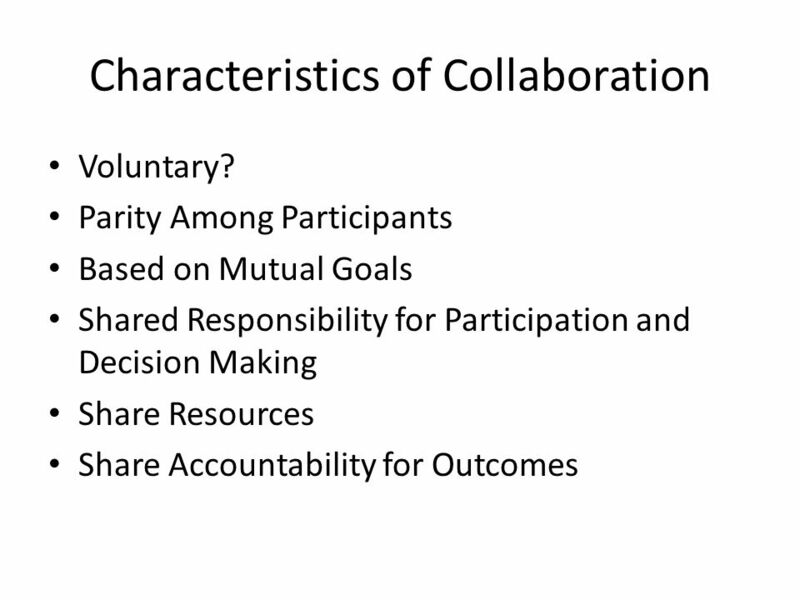 Collaboration and Leadership Alliance: Teaching All Learners October 5, 2010. 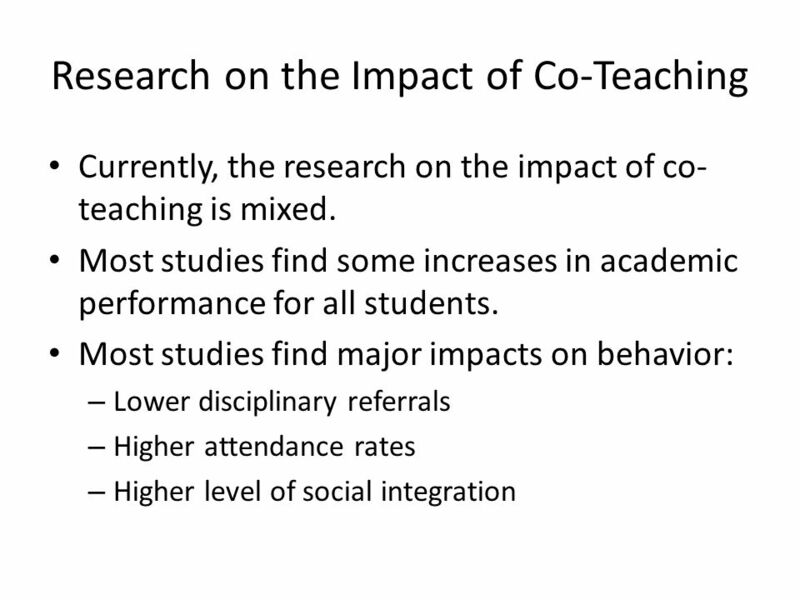 Co Teaching: Upping our Game. We Believe… » All students CAN do math! 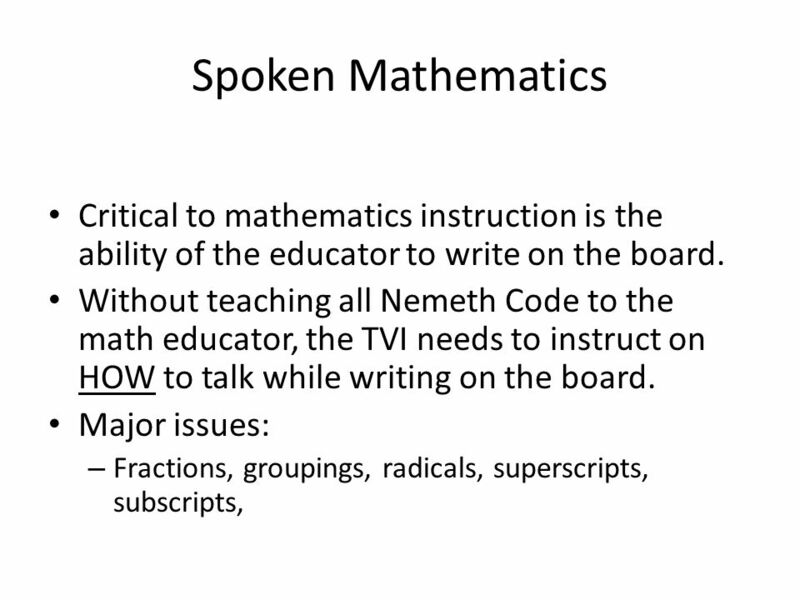 » In order for students to do math they must have SUCCESS with math! » Math is not. CALIFORNIA DEPARTMENT OF EDUCATION Tom Torlakson, State Superintendent of Public Instruction Common Core State Standards AB 250 and the Professional Learning. Common Core Planning for Content & Practice Preparing Los Angeles Students for College and Career. General Notes for Facilitator 1.Depending on the number of participants that you have you may need two decks of cards. You will need a stack of cards that. Productive Math Talk Math Alliance April 3, 2012. Understanding Inclusion Kristin McChesney. Review…  Based on the article, what is the definition – or concept – of inclusion?  The generally accepted. Welcome Welcome to “Getting Results” A National Science Foundation project developed by WGBH with the League for Innovation and 13 community colleges from. Facilitators: Teresa Roe English Language Arts Division Manager, TDS Latahshia Coleman English Language Arts Instructional Facilitator, TDS Session Outcomes.